Need your help! | 100+ Abandoned Dogs of Everglades Florida, Inc. 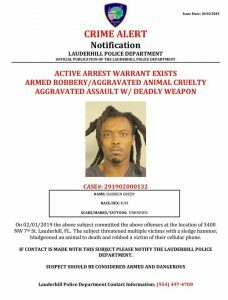 The Lauderhill Police Department needs your help tracking down 32-year-old Darrien Green. He’s accused of using a sledge hammer to brutally beat a one-year-old poodle Friday evening. The dog did not survive. Police say Green is armed, dangerous, and on the run! Have tips? Call 954 493-TIPS.